As you probably already know pilots rely a lot on vision when they fly, like most of us do in everyday life. It is the main sense that we use. So does this then mean that we cannot fly at night? Of course not, but there are some limitations we have as humans. Vision, as mentioned earlier, is great in normal daylight but it has its limitations during the night. First of all to get the eyes used to the darkness they need a minimum of 30 minutes to adjust and give us optimal night sight. Once they have been in darkness for 30 minutes, it is best to use red or green lights in the cockpit because that is what has the least amount of effect on destroying night-vision. To go from a dark to a very light area is a much faster process and only takes a couple of seconds for the eyes to readjust. If we start to take a look at other requirements for night flying, then one of the most important things is the lighting. We need position lights; one red on the left side, a green on the right side and a white light facing towards the rear. These position lights are so that other aircraft can easily spot us in the night sky. Then we have landing lights which is a little bit like putting the full beam on in your car. The light illuminates the area in front of the helicopter so we can see where we are going when taxiing around in the airport or close to the ground. Inside the helicopter we have the cockpit lights so we can see our instruments and often the pilot needs some form of torch, either a head-torch or regular torch in case of an electrical failure, or just to see the map. At this time of year, we must plan ahead of time so that when the sun sets and the night draws in, we can make the necessary preparations for night flying or make sure we are safely back on the ground. 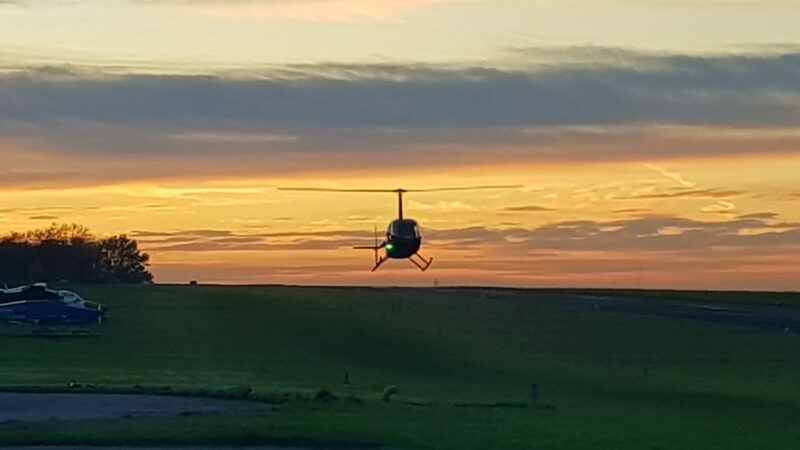 In order to fly at night you will need a night rating but before you can apply for this you must have 100 hours of flight time, 60 hours of PIC and 20 hours of cross country. A course usually involves 5 hours of theoretical knowledge, 10 hours of simulated instrument time and 5 hours of night flight which will include a cross country navigation flight, dual instruction and solo circuits. Once you have the rating, to remain current and carry passengers at night you will need to fly one take off/landing every 90 days.